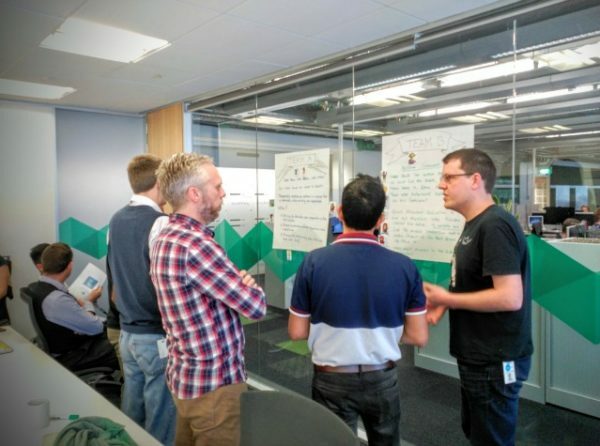 Guest post by: Jaume Durany, Agile Coach at Fairfaxmedia. Boundaries are everywhere, always. And, as Jurgen Appelo explains in his book Management 3.0, a complex system can self-organise only when there’s a boundary around it. That is, every outbreak of organisation happens within the boundaries surrounding it; for instance, the outstanding teamwork that led the All Blacks to become the first team to win consecutive world championships emerged within the boundaries of the playing field and the rules defined by the tournament. We played creatively with our boundaries to support the ABs from NZ. Understanding the value of boundaries in any organisation is key to avoid adding unnecessary layers of management that will go against team self-organisation. All efforts should be focused on defining the right constraints so that a team self-organises within the defined environment to produce results that are valuable to the organisation as a whole. Some months ago we followed this same principle to redefine our teams. Our mission at that moment was to rewire the current teams in order to face new business goals in the best possible way while empowering self-organisation. Instead of trying to manage team formations, processes and workflows upfront, we decided to start by applying the team self-selection experiment shared by Sandy Mamoli to kick-off our new teams. 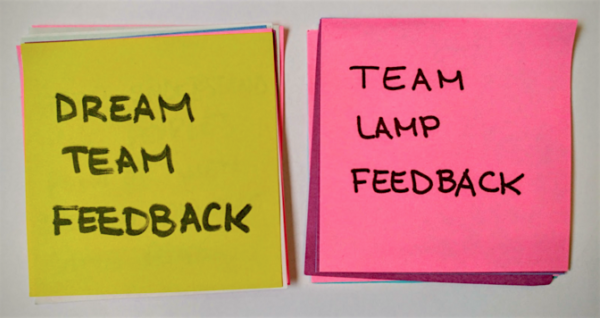 In less than one hour we had our two new teams defined and balanced by the same people forming them: Dream Team and Team Lamp. Teams standing up in front of the two business missions that were presented at the beginning of the self-selection session. The team self-selection activity was a really good example of how to promote self-organisation by setting up the right boundaries. Our effort was focused on defining, structuring and presenting the boundaries of the process so that everybody was aligned to face every decision in the best possible way. The boundaries defined were business goals which the Product Owners pitched for their teams. Then the self-selection process was introduced and kept on the board so that the choice was based on three simple questions in priority order: ‘What is best for the company?’, ‘Where would I be more valuable?’ and ‘What do I want to learn?’. Our next step was to follow the same approach to come up with all the agreements needed to start working as a team. We decided to make use of visuals to define the boundaries of every discussion and facilitate the emergence of team consensus around the minimum set of artefacts and ceremonies needed: the board, the agile methodology, the alignment of communications with remote team members, and the working agreements. We created visuals to setup the boundaries and facilitate teams’ self-organisation. The result of this experiment was truly exciting. We only spent 5 hours and 30 minutes divided in 5 sessions during one week to completely redefine our teams, and, what’s more important, every single step came from the teams, they self-organised since the very beginning to define their initial setup. We kept asking for feedback during the whole experiment and it was really helpful for us to keep adapting the visuals and the boundaries to their needs. Feedback was requested during the whole experiment to keep adapting the boundaries in the best possible way. Since then our main goal has been to keep the same principle in mind, keeping our focus on managing the boundaries and the environment to make sure that what emerges from teams’ self-organisation has value to them and to the organisation. Focus on managing boundaries and people will manage themselves. Tags: case study, Organisational change, Organisations, self organisation, self-selection, Team, teams.